All transactions are safe and secure with a reliable history in online purchasing behind each of our associates. 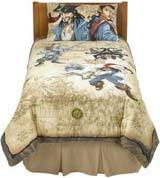 Buy the Pirates of the Caribbean Bedding to own Pirates of the Caribbean clothing and merchandise. This fun Pirates of the Caribbean bedding will have your kids dreaming of high sea adventures alongside Captain Jack Sparrow. Purchase either the 100% cotton comforter or the twin bed POTC sheet set, which both feature animated pirate images featuring the movie's characters. The sheet set includes 1 flat sheet, 1 fitted sheet and 1 pillowcase. The stylish tan POTC bedding looks great in any room. In addition to the Pirates of the Caribbean Bedding above, browse the Pirates of the Caribbean Clothing Gallery for more apparel like men's and women's clothes, kids shirts or hoodies.